Quartz pseudomorphs AND casts after pyrite to Arkansas golden healer cluster - Rare AND unusual to location - and a lot of other locations, too! Not much surprises us after 27 crystal years, but we're so excited we sent this particular cluster and a few others to Mr John Attard for testing! So. VERY clear golden healer plate cluster of 2-1/4x 4x 1-3/4" high sitting flat. Fine iron oxide dendritic figurals under drusy quartz mark some crystals. 1/4x 1/4" open drusy case after pyrite. 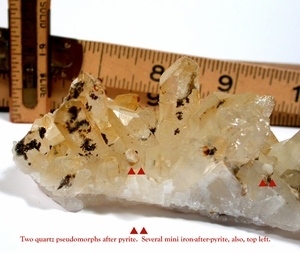 Numerous drusy-over-iron-over-quartz and milky quartz pseudomorphs from 1/16" to 3/16". Two crystals are faceless, one is chipped, several are geometrically etched, two have an uncommon 7h face. Record keepers. A great addition to your type-locality collection - this is the mine for golden healers - pseudomorph or casts collection - or your dendrite line-up!